Well established in the consumer electronics industry, Digital Audio Signal Processing (DASP) techniques are used in audio CD, computer music and multi-media components. In addition, the applications afforded by this versatile technology now range from real-time signal processing to room simulation. 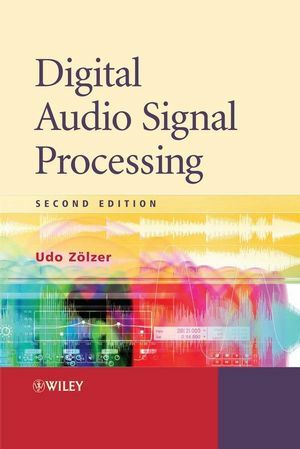 Digital Audio Signal Processing, Second Edition covers the latest signal processing algorithms for audio processing. Every chapter has been completely revised with an easy to understand introduction into the basics and exercises have been included for self testing. Additional Matlab files and Java Applets have been provided on an accompanying website, which support the book by easy to access application examples. This essential guide to digital audio signal processing will serve as an invaluable reference to audio engineering professionals, R&D engineers, researchers in consumer electronics industries and academia, and Hardware and Software developers in IT companies. Advanced students studying multi-media courses will also find this guide of interest. Professor Zölzer is a Professor and Head of the Department of Signal Processing and Communications, Helmut Schmidt University, University of the Federal Armed Forces, Hamburg, Germany since 1999. His research interests include audio and video signal processing and communications. 1.4. Audio Components at Home. 2.3. Spectrum Shaping of Quantization - Noise Shaping. 2.5. Java Applet - Quantization, Dither, and Noise Shaping. 3.4. Java Applet - Oversampling and Quantization. 5.5. Java Applet - Audio Filters. 6.4. Approximation of Room Impulse Responses. 6.5. Java Applet - Fast Convolution. 7.6. Java Applet - Dynamic Range Control. 9.6. MPEG-2 Advanced Audio Coding. 9.9. Java Applet - Psychoacoustics. DAFX Advanced algorithms can be found here. Digital Audio Signal Processing Visit for further studies including audio demonstrations, exercises and Matlab examples.